NIBIN evaluates ballistic evidence to identify shooters and can connect a gun to multiple crime scenes. 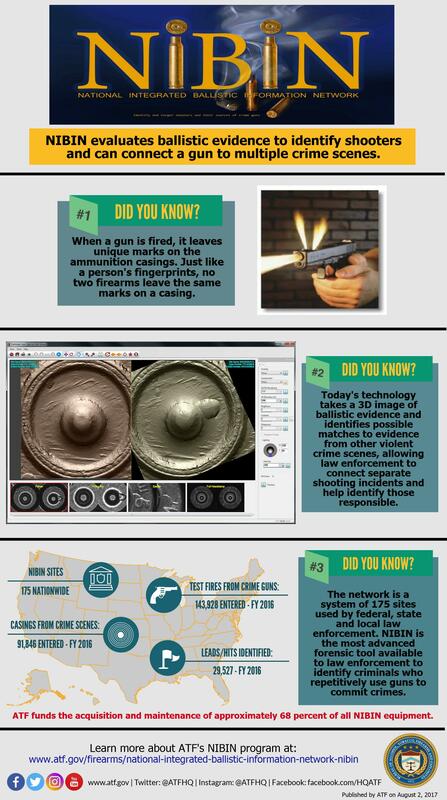 Did you know that today's technology takes a 3D image of ballistic evidence and identifies possible matches to evidence from other violent crime scenes, allowing law enforcement to connect separate shooting incidents and help identify those responsble? Did you know that the network is a system of 175 sites used by federal, state, and local law enforcement? NIBIN is the most advanced forensic tool available to law enforcement to identify criminals who repetitively use guns to commit crimes. ATF funds the acquisition and maintenance of approximately 72 percent of all NIBIN equipment.